Checking correctness of drawings and other art. Today I would like to share some secrets on checking the correctness of your drawings. The following steps are before you frame your art. 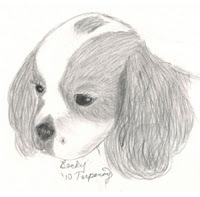 Additions and corrections are faster and easier to make on an unframed drawing. These are the steps I found most helpful over the years to check art for correctness in the shadows, perspective, details or places that still needs some work. Always do these steps before delivering any art to the client. 1. Hold the drawing so you can see it in a mirror. Sometimes places that need more work will jump out at you. 2. Turn the drawing upside down and look at it in a mirror. Make any changes to your art if needed as you go through these steps. 3. Now set the art upside down in your living room or someplace you will see it a lot. Continue to look at it and make changes for a few days. 4. Finally set it right side up a few more days. Make changes if needed. When you are satisfied with the final project then frame it and deliver it to your happy client. The drawing for the car showcase backdrop is coming along nicely. The finished project will end up in the Detroit, MI area. 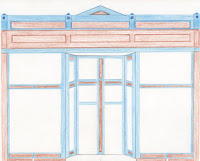 It will be made up of numerous color pencil sketches of vintage storefronts. The showcase will hold precision cars with the backdrop drawings being the city. I love the design of this first building. 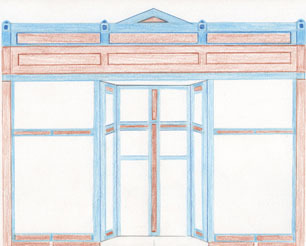 The client wants it named "Becky’s Art Studio". I feel really proud that he has picked and named this building as the first drawing in the project. I don’t know what the next drawing will be. I took over 90 storefront photos for him to pick from. So far only 6 storefronts have made the cut. I may have to go on another Sunday drive and take more photos. I just love Sunday drives even if they are not on Sunday. If you want to see a detailed progress of this project you can follow it on Facebook by clicking the facebook link on this blog. Pets are still a big part of my drawings. October 9, 2010 is Western Illinois Animal Rescue is having a doggy 5K. TerpCreek.com will be donating to that event. I will be there around 8 am, so if you are there look me up. The backdrop for the Detroit car showcase is coming along nicely. It will take some time to get all 15 feet of it done. Spoon River Drive was nice last weekend. Sunday was a wonderful day to go and check out the vendors and beautiful scenery. This weekend will be even better, however I am not going to be on the drive this last weekend.